Now is the time to shed the responsibilities of home ownership and live in a community that is alive with fun and culture. 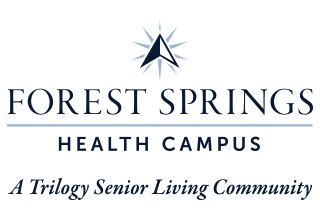 Offering luxurious Independent Living villas in Louisville, KY, Forest Springs Health Campus has just the home for you. You’ll love the freedom to spend your days as you please almost as much as you’ll love leaving the dirty work of home upkeep behind. Each of our private Independent Living villas includes a beautiful, fully equipped kitchen with granite countertops and custom cabinetry. Bring your small pup or cat along for the ride, as our villas are pet friendly. Feel the calm that comes with belonging to a community that suits your interests and makes the everyday that much easier. Feel confident in your choice of Forest Springs Health Campus. Every service we offer our Independent Living residents means one less thing to worry about. Tired of separating your darks from your lights? Our team is happy to take care of your laundry. Love the look of a well-kept yard? We take pride in our beautiful grounds. We know that as the hamster wheel of life slows down, opportunities for fun and fulfillment are just getting started. That’s why we help take care of more than chores. Forest Springs Health Campus provides community activities and events onsite, as well as transportation to group outings, so you can enjoy hobbies of old and find new passions, too. Are you interested in starting life in our Independent Living neighborhood? Call us today and we’ll be happy to set up your personal tour.